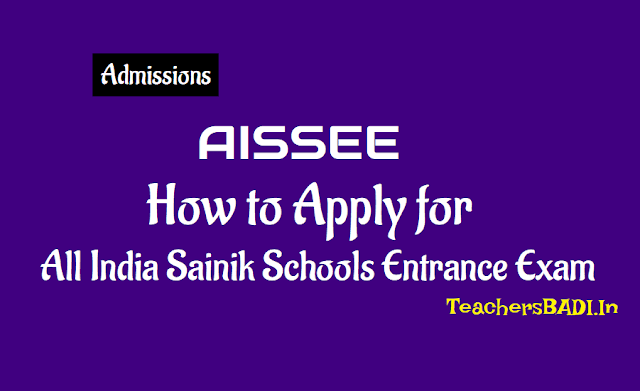 How to apply for All India Sainik Schools Entrance Exam (AISSEE) 2019: All India Sainik Schools Class 6, 9 Entrance Exam (AISSEE) 2019 for Sainik School Admissions 2018. AISSEE Sainik Schools Entrance Exam Online application form: AISSEE online application forms open for 6th to 9th Classes on sainikschooladmission.in. Sainik Schools AISSEE 2019: The online application forms for classes 6 to 9 of All India Sainik school Entrance examination 2019, AISSEE has begun the registration process on the official website, sainikschooladmission.in. The entrance exam shall be conducted on January 6, 2018. The last date to apply for AISSEE 2019 is December 1, 2018. An application fee of Rs. 400 would be applicable for general and defence category students and Rs. 250 for SC/ST students. Check exam pattern and direct link to submit the application form for AISSEE 2019. AISSEE conducts entrance exam every year across the country for admissions to classes 6 to 9. The admission process is done through merit list and medical examination. For AISSEE 2019 the merit list will be released on February 4, 2019 while, the last merit list shall be released on March 11, 2019. Students may also receive scholarships that will be dependable upon family income and category. AISSEE Sainik School Admissions 2019 Registration begins at sainikschooladmission.in, Apply before 26th November 2018: The Sainik Schools Society is scheduled to organize the All India Sainik Schools Entrance Exam (AISSEE) 2019 on Sunday, 6th January 2019 for boy students seeking admissions in Classes 6 and 9 for the academic year 2019-20 in the 26 Sainik Schools across the country. For Class VI, age should be 10 - 12 years as on 31st March 2019 and within 1st April 2007 - 31st March 2009. For Class IX, age should be 13 - 15 years as on 31st March 2019 and within 1st April 2004 - 31st March 2006. How to register for AISSEE Sainik School Admissions 2019? AISSEE Sainik School Admissions 2019 Registration has begun on 8th October 2018 on the official website of Sainik School Society - sainikschooladmission.in. The Sainik Schools Society is scheduled to organize the All India Sainik Schools Entrance Exam (AISSEE) 2019 on Sunday, 6th January 2019 for boy students seeking admissions in Classes 6 and 9 for the academic year 2019-20 in the 26 Sainik Schools across the country. Boys between age group 10 to 12 years and 13 to 15 years can apply for Class VI and IX Admissions, respectively. The age criteria will be reckoned as on 31st March 2019. Class 6 entrance exam: Class 6 entrance exam would consist of 125 questions available in three langugaes- English, Hindi and Malyalam. Students may answer question paper in any ot three languages. The maximum marks will be 300 marks divided between mathematics, General Knowledge, Language and Intelligence based questions. Class 9 entrance exam: Class 9 AISSEE question paper would contain 50 questions in Maths, 25 in Intelligence, English, General Science and Social studies 25, etc. The question paper would be of 400 marks. However, the question paper for class 9 students would be available only in one language- english. Students would be required to answer in the same language.